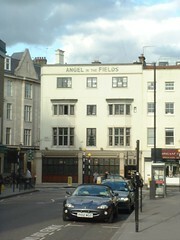 Samuel Smith's pub in Marylebone, just beyond the end of Marylebone High Street. Inside, it's the usual nicely-presented teak-panelled rooms, with large tables. There's a fireplace, but no fire going on a December 2008 visit so it may not be used. There's an upstairs room as well as the downstairs bar. There are no handpulls, though the usual range of Sam Smith's bitters and lagers is on draught. Comment added by Rowley Birkin QC: Free wifi ("ANGELAIR" - slow to connect, but gets there eventually, with decent signal). Last edited 2013-01-22 14:49:37 (version 9; diff). List all versions. Page last edited 2013-01-22 14:49:37 (version 9).